As I have gotten older, I have noticed that my skin is becoming drier. There are many different things that can cause this; the sun, soaps, fragrances that you wear, stress, and so on. This is why I always use lotions and moisturizers to help keep my skin smooth, healthy, and balanced. However, sometimes I am in a rush and sitting down to apply lotion all over my body and make sure it is thoroughly rubbed in doesn’t always fit into my busy schedule. On the extremely busy days, my skin gets neglected and it does not take long before my skin begins to feel noticeably drier. This is especially the case when I happen to miss a few days in a row. 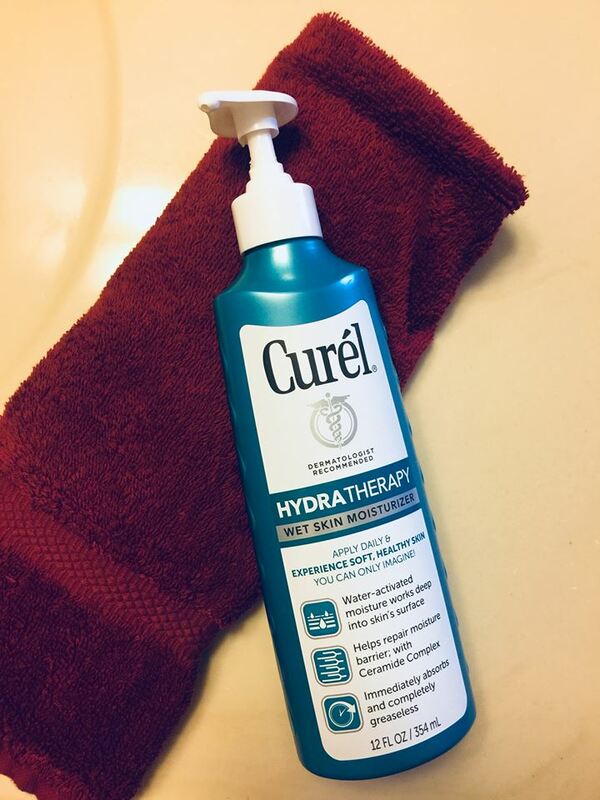 I recently had the opportunity to try Curel Hydra Therapy Wet Skin Moisturizer I have wanted to try this product for some time and was really excited to see all of the promised benefits to help heal my dry skin. I found out that, not only does this product work as promised, but it can also be conveniently applied in the shower, directly on your wet skin! I have been using this product for a few weeks and can honestly say, I am both feeling and loving the results. 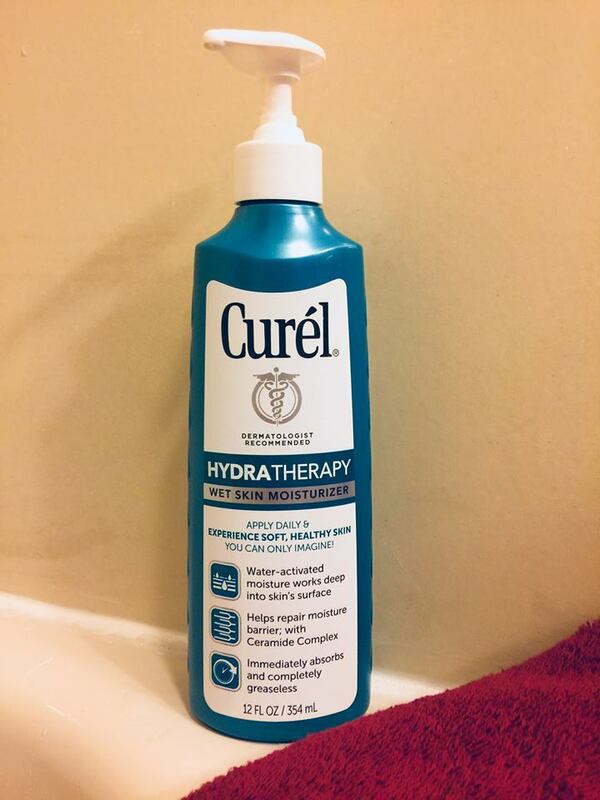 The Curel Hydra Therapy Wet Skin Moisturizer is very easy to use. After you have taken your shower and turned off the water, simply apply the moisturizer onto your skin like you would any lotion. However, there is no need to rub into your body until it is completely absorbed. This is because your pores are open from the heat and water of the shower, which allows the moisturizer to absorb into your skin fast and effectively. Then just dry off as normal. When using this product I am still applying lotion all over my skin, however, with Curel it is taking only a fraction of the time it took before. Traditional lotion can take what seems like FOREVER to rub completely into your skin. This does not require that due to your pores being opened from the shower. My skin has not felt itchy, sticky, greasy, or filmy, after using this product. The moisturizer rubs in and towels off perfectly with nothing but soft skin left behind. Also, do not worry about this product causing a film to build upon your tub or shower. It rinses away easily and leaves no scum behind. I do like to rinse the tub out after my shower just to be extra-sure. I love how smooth my skin is feeling after a few weeks. My skin not only feels smooth and hydrated, but it also looks healthier. This is an especially great product to use with winter coming up fast, and heated houses which contribute to dry skin in a major way. The heat from our furnace always dries my skin out badly. The Curel Hydra Therapy Wet Skin Moisturizer is helping me avoid that, as well as helping to maintain healthy soft skin. And it is great for those hectic days when I don’t have the time to apply traditional lotion. I feel like this product has really made my skin amazing!